Wreckage from the Guardian Flight’s Beechcraft King Air 200 was salvaged March 28, 2019, by crews working for the air ambulance company. 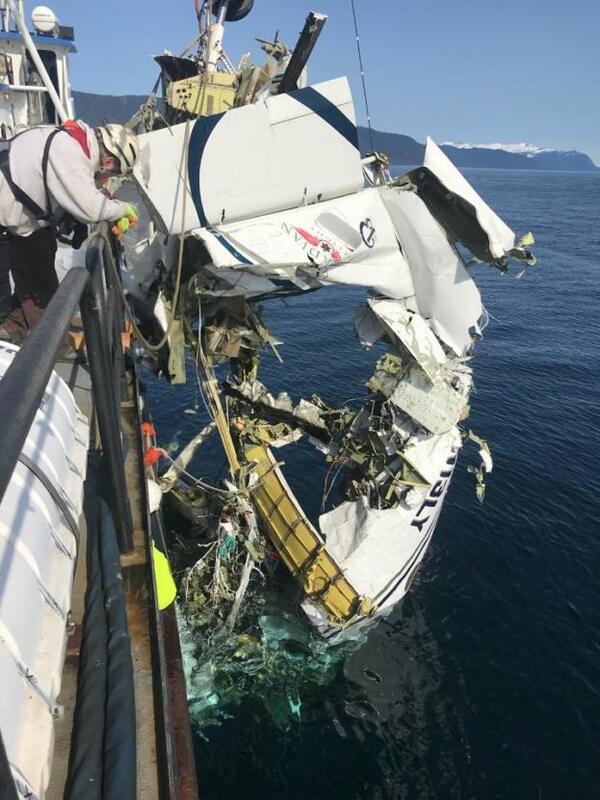 (Photo courtesy of the NTSB’s Alaska regional office). When the Coast Guard received a report from the Kake clinic of an overdue air ambulance, its nearest helicopters at Air Station Sitka were about 40 miles away. Coast Guard Commander Michael Kahle said the air station maintains three MH-60 Jayhawk helicopters: one disassembled for parts, one as a backup; the third is the “ready bird” for rapid response. But according to mission logs obtained by CoastAlaska under the Freedom of Information Act, the Sitka air station’s “ready bird” Jayhawk immediately ran into problems. The logs indicate an engine contingency switch had malfunctioned — effectively grounding the helicopter overnight. After crews in Sitka weren’t able to get their helicopters cleared for take off, a second Jayhawk was requested from the Coast Guard’s Air Station Kodiak — 600 miles away. That meant there was no aerial search over Frederick Sound for the first 12 hours. On the water it was a different story. The Coast Guard had quickly alerted the Cutter Anacapa, which was already in the area, and local search and rescue teams also searched for signs of the missing plane overnight. Air Station Sitka got its Jayhawk in the sky the following morning. After completing a single search, the logs indicate it ran into the same mechanical problem. Its crew refueled in Petersburg and returned to Sitka for more repairs. The longest federal government shutdown in history had ended just a few days before. Kahle said the Coast Guard’s maintenance schedule had been affected. He confirmed parts of an article in The New York Times that stated dockside maintenance to ships in Sector Juneau were delayed. The Coast Guard acknowledges its aerial response was delayed that night. But Kahle said it didn’t impact the overall response. Federal authorities still don’t know what caused the Beechcraft King Air 200 to plummet more than 2,500 feet in 14 seconds before vanishing from radar. The cockpit’s voice recorder was recovered by searchers contracted by Guardian Flight. But Clint Johnson, the National Transportation Safety Board’s regional chief in Anchorage, said it’s in poor condition. He added the lab should know whether the data is recoverable within the next week. Most of the plane’s wreckage has since been recovered around 22 miles west of Kake. It’s now in a hangar in Juneau. Representatives from Raytheon and Pratt & Whitney which built the airframe and engines will be assisting NTSB investigators. Johnson said it’ll likely be some time before the public gets any answers. “It’ll probably be another probably six, eight months, at least before anything else is released,” he said. Following the Coast Guard’s intensive three-day search, Guardian Flight spent two months looking for its lost aircraft and crew. Last week the company announced it had wrapped up its search. The bodies of Juneau-based pilot Patrick Coyle, 63; paramedic Margaret Langston, 40 and nurse Stacie Rae Morse, 30, remain lost at sea.